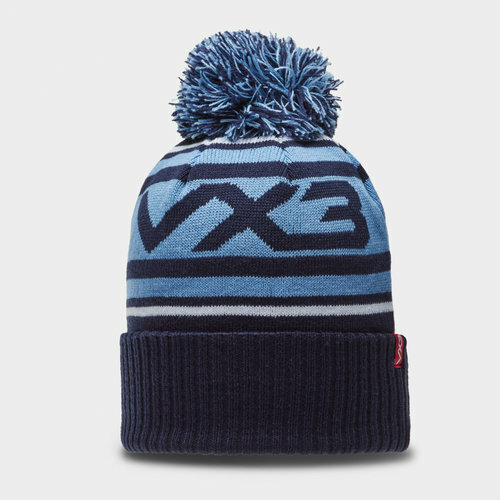 With those cold, winter days and nights creeping upon us it's important to stay protected in this VX3 Bobble Hat in a Navy, Sky and White colourway. With our winters getting colder and colder and weather reaching extremes you'll need to stay dry, warm and protected from the elements in this comfortable bobble hat. The lightweight fabric provides the superior warmth and comfort whilst the material wicks sweat away from the wearer whilst drying really fast. Made from acrylic knit one size should fit all. This hat comes predominantly in navy with 3 sky blue stripes inside 2 white stripes. The brand VX3 can be seen in navy on the middle sky blue stripe. Any wearer of this hat is sure to stay stylish and extra toasty whilst conquering the weather.